This is the list of things to check before launching your dating website and making it available for new members and visitors. 1. Edit the standard site copyright to your own (manual on how to do that). 2. Upload new site logo and favicon (more about favicon, and tips on how to change logo). To edit the site logotype, log in as administrator (site.com/admin), go to Interface > Themes > select active user mode theme and click the pencil icon > Logo editor (e.g. site.com/admin/themes/view_installed/3). 3. Check SEO meta-tags (title, keywords, description) and other settings. Once you authorize in admin panel, go to System > SEO settings > choose Global settings (site.com/admin/seo/index) and SEO advanced settings (site.com/admin/seo_advanced/index/). 4. Edit site texts including welcome message on the main page. Go to Content > Languages > Pages (site.com/admin/languages/pages/) > select ‘start (User and Admin index pages)’. 5. Change default administrator’s login and password to yours. Go to Administrators > edit administrator (site.com/admin/ausers/edit/1). 6. Create a mailbox or several mailboxes with your site domain on your hosting control panel. 7. Change FROM email address for the email notifications that site members will receive. In the admin panel, go to Content > Mail alerts > Settings (site.com/admin/notifications/settings/). 8. Sign up as a site member and check the welcome messages (you may want to edit the texts as well). 9. Go to Users > Users settings (site.com/admin/users/settings/) and mark ‘approve users’ as a paid service if you want to make registration cost a fee. To activate other paid options that you will use and to set the prices, go to Payments > Services (site.com/admin/services/index/), Packages (site.com/admin/packages/index/), and Memberships (site.com/admin/memberships/index/). 10. Set up moderation rules for new members, comments, text messages, and uploads under Moderation > Moderation settings (site.com/admin/moderation/settings/). Create moderator account(s) under Administrators > Add moderator (site.com/admin/moderators/edit). 11. Activate payment gateways on the site with your merchant accounts. Go to Payments > Billing systems (site.com/admin/payments/systems/). 12. Activate social widgets (share, like, social sign on): System > Social networks (site.com/admin/social_networking/services/). 13. Prepare to publish mobile apps — send the info to our Customer Support team (what to send). 14. Replace links to demo mobile apps to yours both in the admin panel and on the main page of your site. In the admin panel, go to Modules > Mobile (site.com/admin/mobile/index/). For the ‘pleasure’ landing page, open file index_pleasure.twig in directory /application/modules/start/views/flatty and edit the links in blocks ‘b-afterheader’ and ‘b-mobile__text’. 15. If necessary, create new fields in user profile and in search form (advanced search): System > Field editor > Fields (site.com/admin/field_editor/fields/) and Forms (site.com/admin/field_editor/forms/). 16. Create and activate RSS feeds for news: Content > News > Feeds (site.com/admin/news/feeds/) and horoscopes: Content > Horoscope > RSS/XML feeds (site.com/admin/horoscope/feeds/). 17. Edit Terms and Conditions, About us, and other information pages under Content > Info pages (site.com/admin/content/index/). 18. Edit background picture for the main landing page. There are a lot of options here, please contact Customer Service team for more details. 19. Set up and activate the map: System > Geo maps (site.com/admin/geomap/index/). 20. Install countries, regions and cities that you plan to have on your site; check the installed database for completeness. For installation, go to Content > Countries (site.com/admin/countries/index/). 21. See if you require extra language versions for your site. Export files for translation under Modules installation > Languages (extra level of authorization, site.com/admin/install/langs); edit words and phrases directly on the site under Content > Languages > Pages (site.com/admin/languages/pages/); or request an .xlsx file from Customer Support team. 22. Set up the site currency: Payments > Settings (site.com/admin/payments/settings/). 23. Edit colour scheme of your site: Interface > Themes > select active user mode theme and click ‘View colour scheme’ > select active colour scheme and click ‘Edit’ (e.g. site.com/admin/themes/edit_set/3/16). 24. Set up banners under Banner ads (site.com/admin/banners/index/). Add Google AdSense code with the special add-on. 25. Activate Dating Pro Network connection. Contact Customer Support team for assistance. 26. Delete or replace demo content with yours. Kisses: Modules > Kisses (site.com/admin/kisses/index/). Virtual gifts: Modules > Virtual gifts (site.com/admin/virtual_gifts/index/). Gift store items: Gift store > Items (site.com/admin/store/products/). Questions: Modules > Questions (site.com/admin/questions/index/). Associations: Modules > Associations (site.com/admin/associations/index/). Polls: Modules > Polls (site.com/admin/polls/index/), and other options. 27. 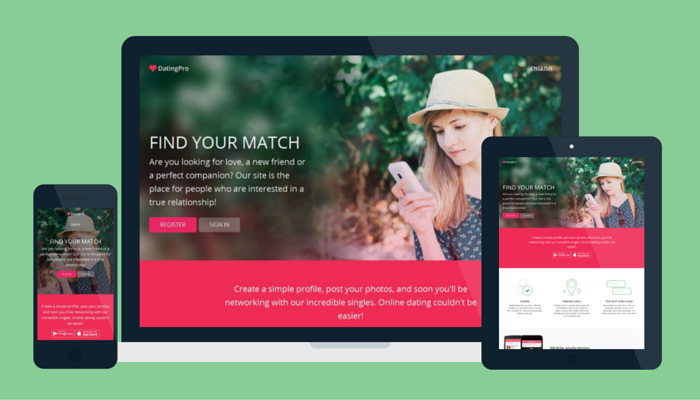 See if you want to add more functionality to your site: Dating Pro Marketplace.